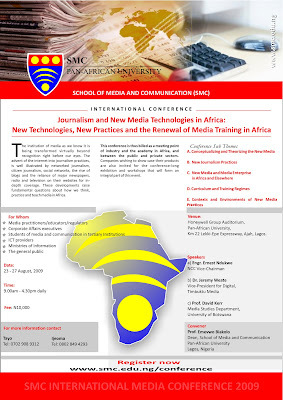 Your favourite oyinbo/onyeocha/bature blogger will be speaking (click to enlarge and read the conference flyer above) on the first day of this 5 day conference hosted by the School of Media and Communication at the increasingly regarded Pan African University in Lekki. I'll be comparing old vs new media models of news production/consumption, making some predictions for the next year and discussing my role in setting up NEXT. Should be an interesting gathering.. This looks very informative and I really wish I could attend. I am a journalism and literature grad student and journalism in Naija has always interested me. Could you do us all a favor and perhaps put up a video and transcript of your speech and other key highlights.